24" Glaro Deluxe Wall Aluminum Mount Cigarette Disposal - 4 Lbs. 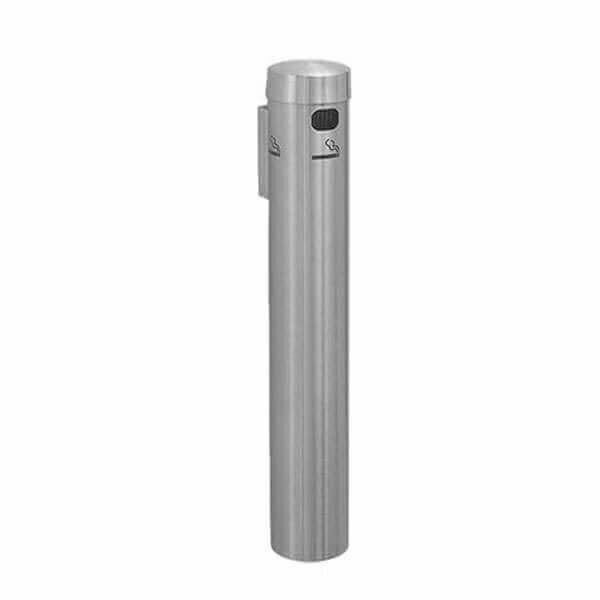 This space saving 24" Glaro Deluxe aluminum wall mount cigarette disposal is a great addition to office buildings, apartments, and restaurants. Crafted out of 1/8" thick tubular solid aluminum wall with clear coat, this quality cigarette disposal is ideal for outdoor use in any weather condition without rusting. The wall mounting bracket and back of the body has a hidden customized tamper-resistant keyhole for security but requires no key to empty or clean. Includes an internal cigarette snuffer panel to extinguish cigarettes and cigars without any offensive odors. This product is made in the USA and is supported by our 2-year commercial warranty. Must order a minimum of 2 per order. • Dimension: L 3.5" x W 3.5" x H 42"
12" Glaro Deluxe Wall Aluminum Mount Cigarette Disposal - 3 Lbs. 12" Glaro Deluxe Wall Brass Mount Cigarette Disposal - 3 Lbs. 24" Glaro Deluxe Wall Brass Mount Cigarette Disposal - 4 Lbs. 42" Glaro Deluxe Cigarette Disposal Surface or In-ground Mount - 8 Lbs. 42" Glaro Deluxe Portable Cigarette Disposal - 28 Lbs.